From the nascent days of the Spanish Civil War to the desperate, final defence of the stricken Reich, the Messerchmitt Bf 109 was the Luftwaffe's signature fighter. From the very beginning of its combat career it came to symbolize what could be achieved with a modern monoplane fighter aircraft, instilling fear and respect into Allied pilots wherever it was encountered. 35,000 of the ubiquitous Messerschmitts were eventually built, making it the most-produced fighter in history. 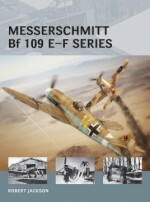 This is the first Air Vanguard volume to cover the Bf 109, detailing models A-D. Featuring stunning aerial photos the title explores in depth the technical characteristics and combat performance of the early Bf 109s, including their combat debut in the Spanish Civil War, their employment in the invasion of Poland and showing how the type became one of the most famous names in aviation history. Born in 1941 in North Yorkshire, Robert Jackson was educated at Richmond School, Yorkshire. He is a full-time writer and lecturer, mainly on aerospace and defence issues, and was the defence correspondent for North of England Newspapers. He is the author of more than 60 books on aviation and military subjects, including operational histories on famous aircraft such as the Mustang, Spitfire and Canberra. A former pilot and navigation instructor, he was a squadron leader in the RAF Volunteer Reserve.Adam Tooby is an internationally renowned digital aviation artist and illustrator. His work can be found in publications worldwide and as box art for model aircraft kits. He also runs a successful illustration studio and aviation prints business.